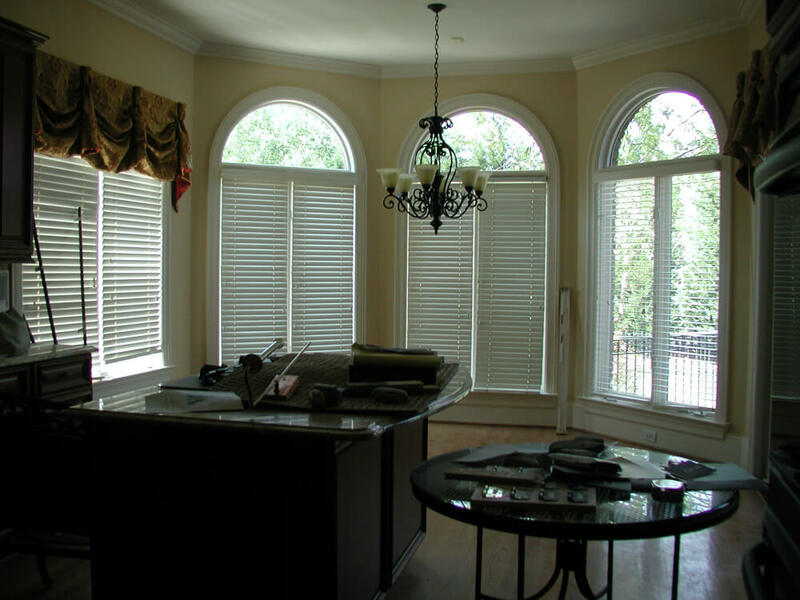 We are passionate about helping our clients enhance the way they live by creating spaces that they love for life. 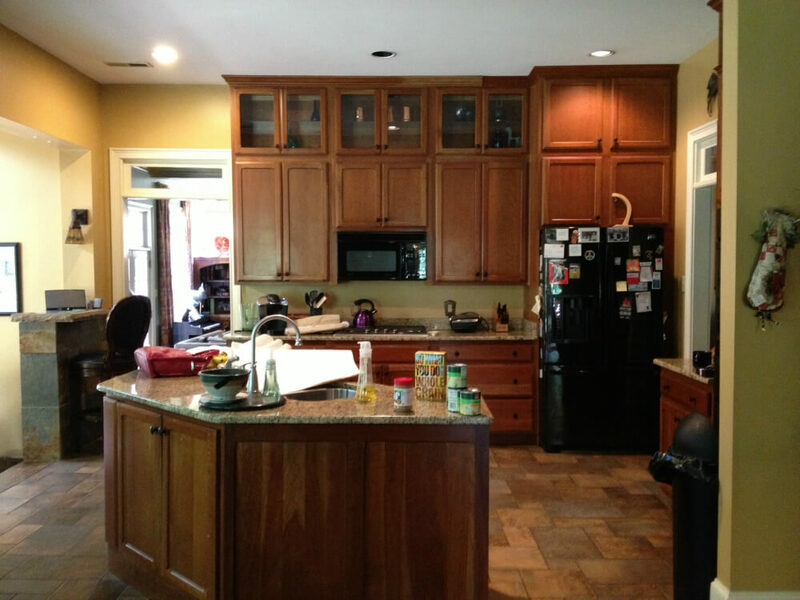 Please enjoy this small sampling of kitchen remodeling transformations. 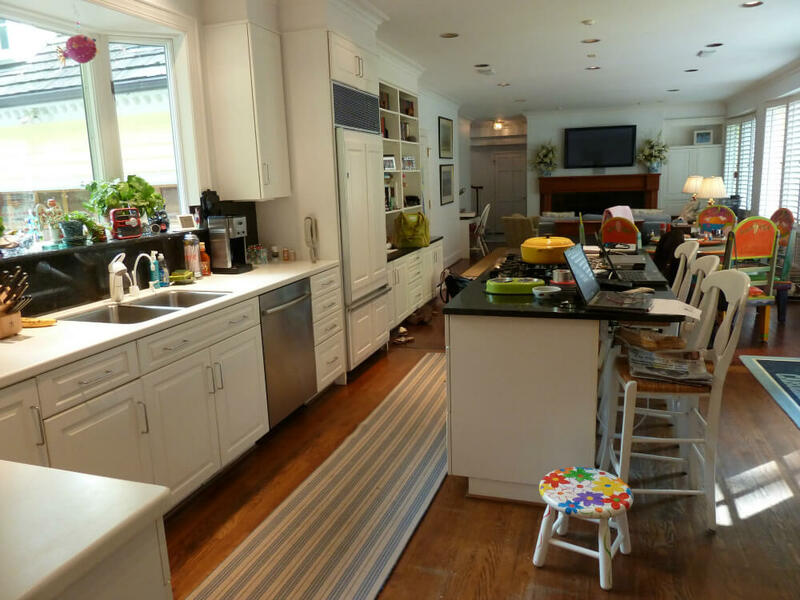 This existing family room was transformed into a wonderful light-filled and spacious kitchen for a family of 8. 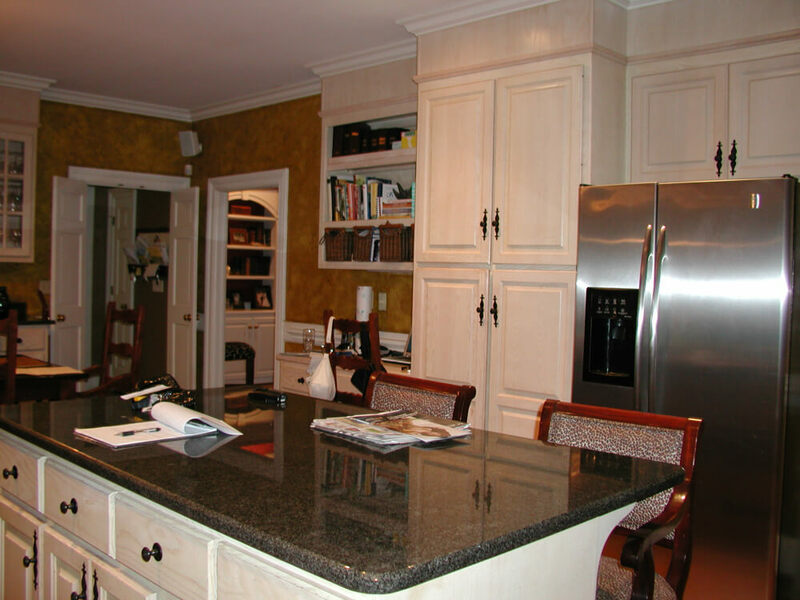 The old kitchen was completely gutted and became the ideal spot for a large eating area and dry bar. 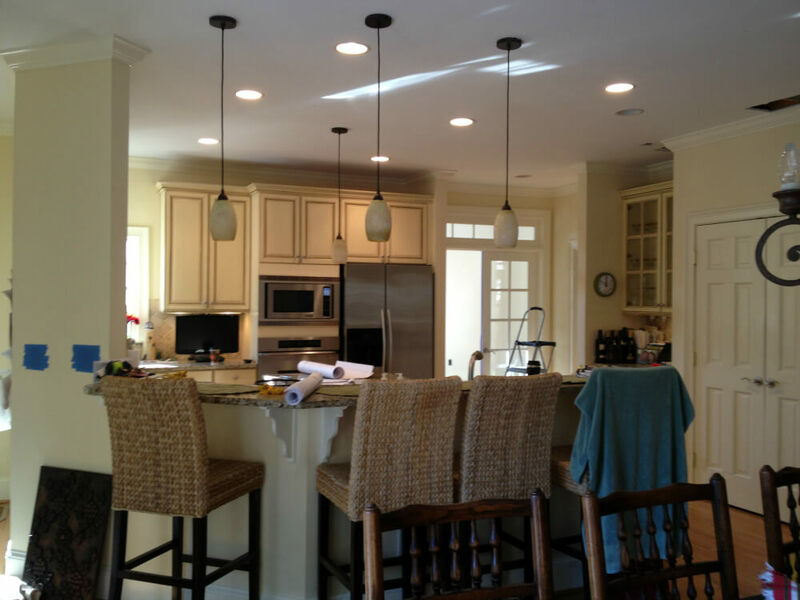 This space is a perfect transition between the new kitchen and family room. 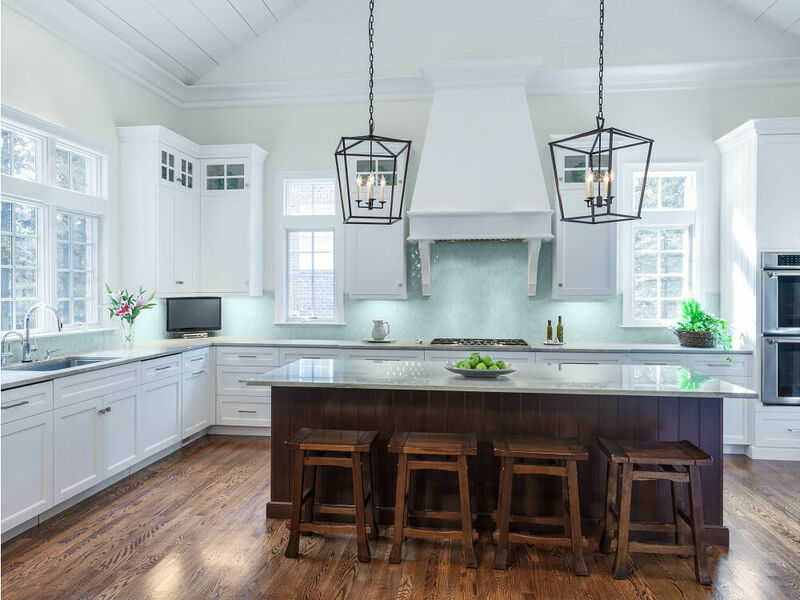 This 1980’s kitchen was completely gutted and renovated into an exceptional gourmet kitchen with all the bells and whistles. 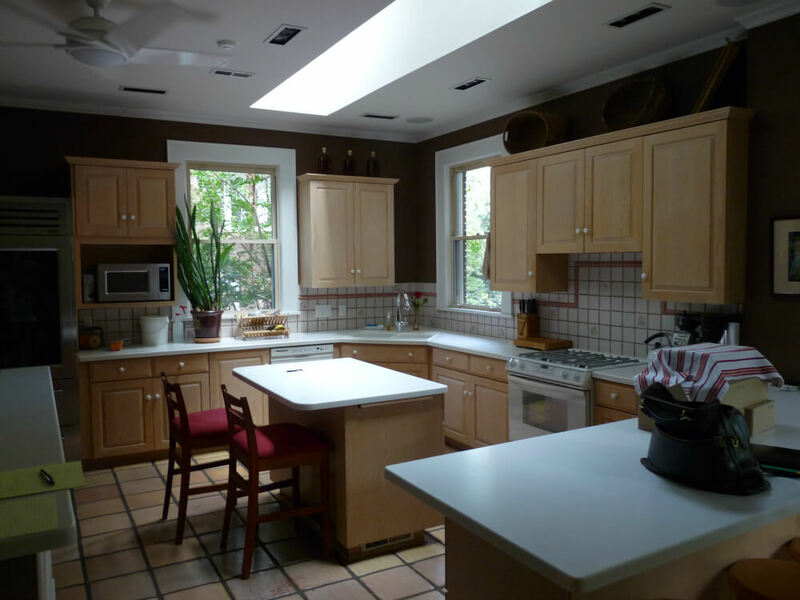 The existing kitchen did not reflect the historic character of this 1920 home or meet the needs of the homeowners. 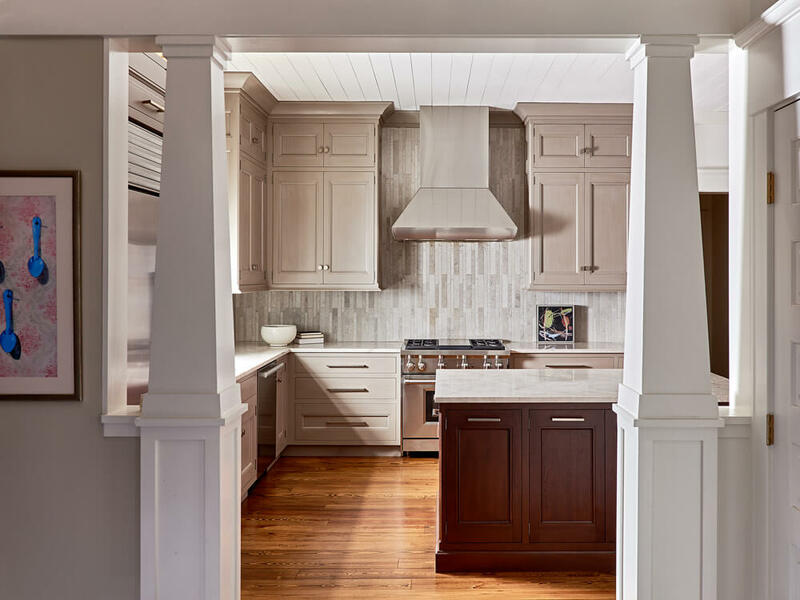 The new kitchen is complete with custom built-in cabinetry, state of the art appliances,, and finishes that reflect the personality of the homeowners. 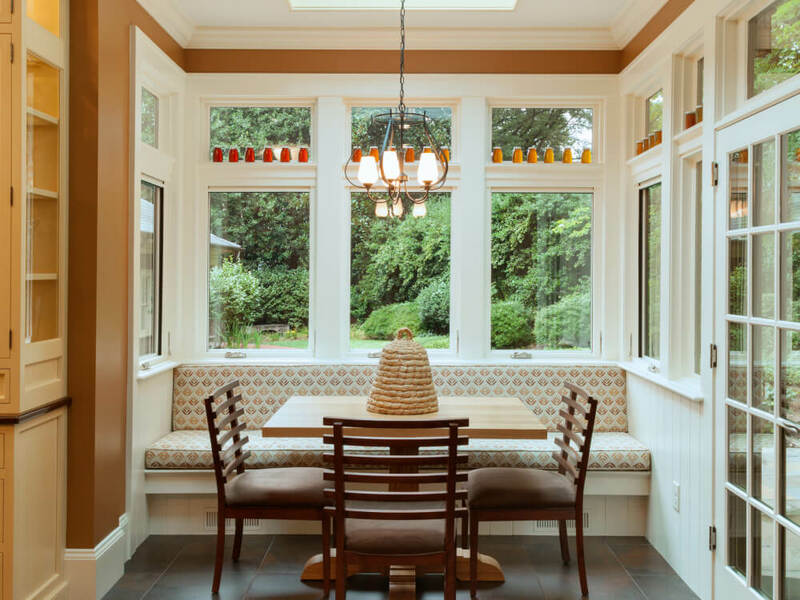 The new breakfast nook with the custom skylight designed by Don Duffy Architecture is the perfect compliment to the kitchen. 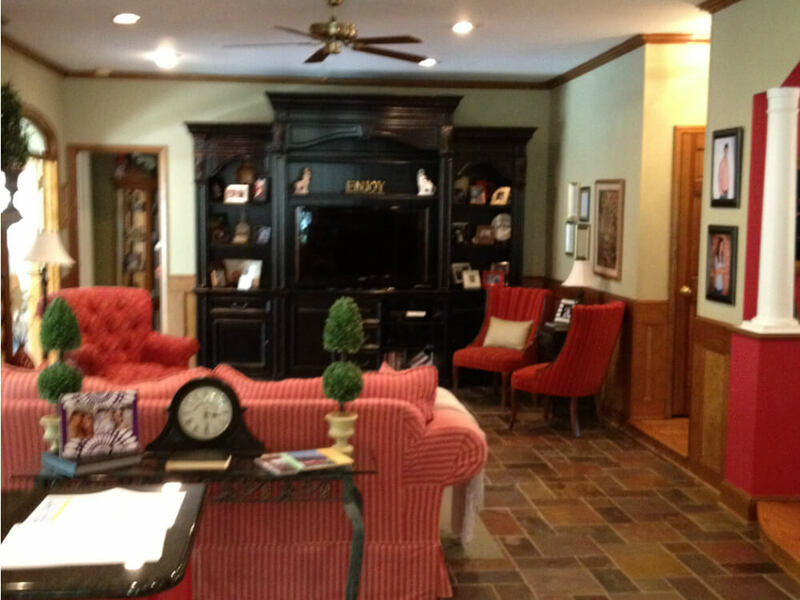 The homeowners are avid collectors of handcrafted clay art pieces. 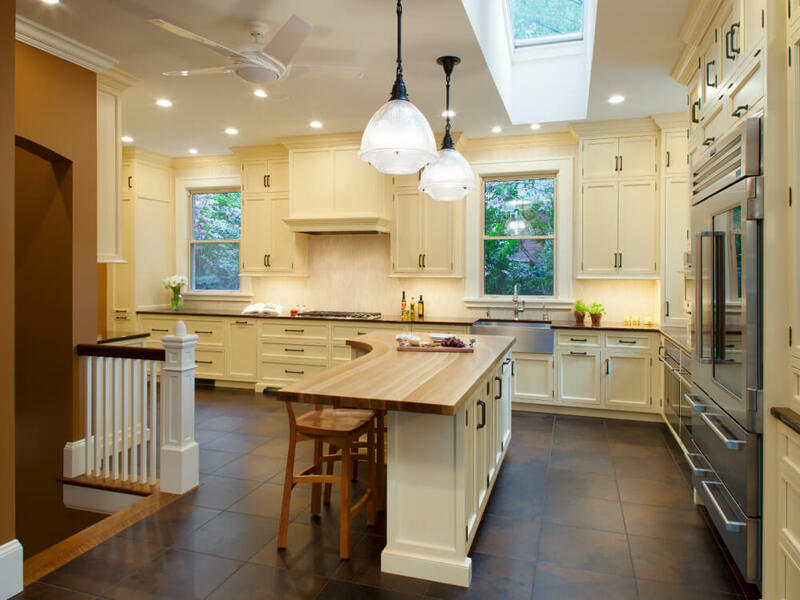 Their love of texture and wood are represented in this new kitchen. 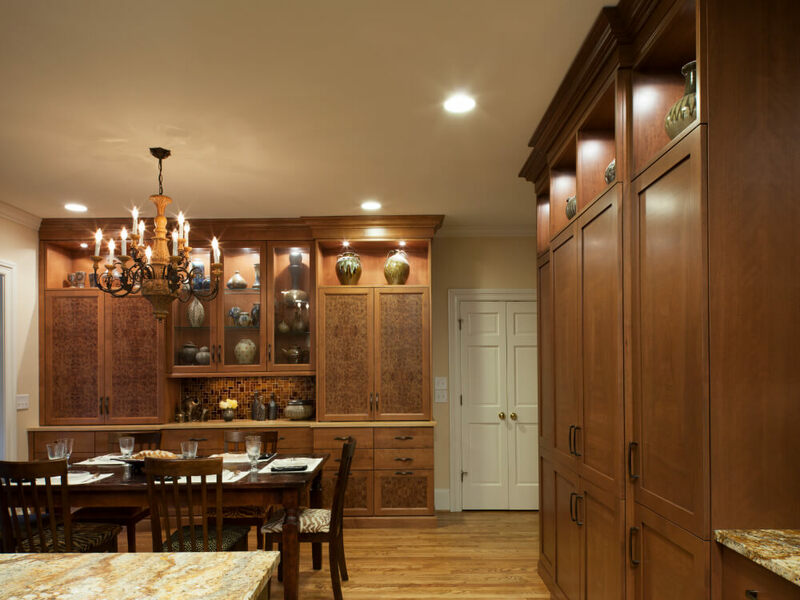 The custom “X” veneer doors were designed to make the pantry look like a piece of furniture in this kitchen remodeling project. 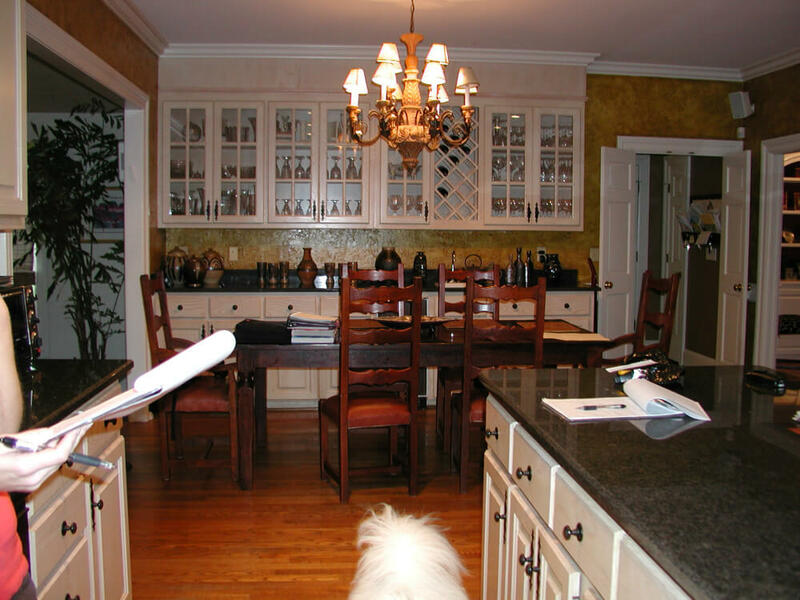 This custom furniture piece in the breakfast area was designed to display a large portion of their clay collection. 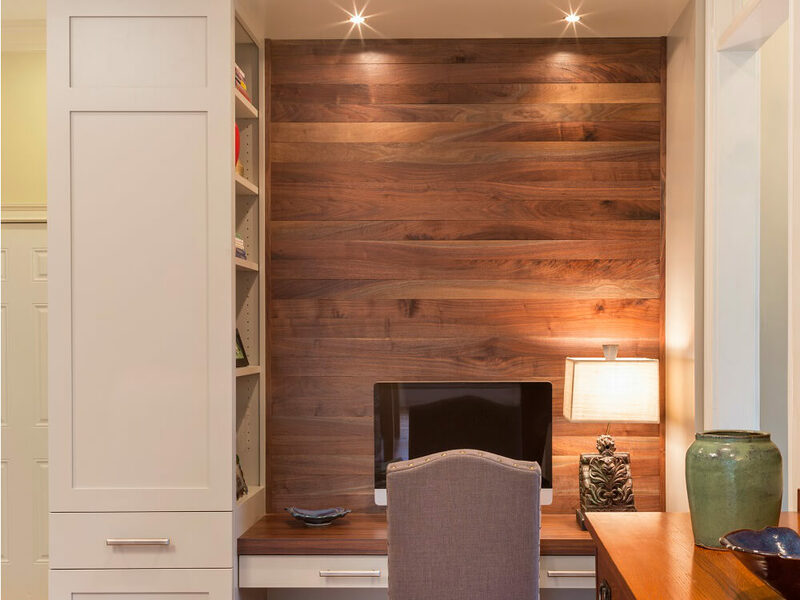 The burled elm wood doors are a perfect compliment. 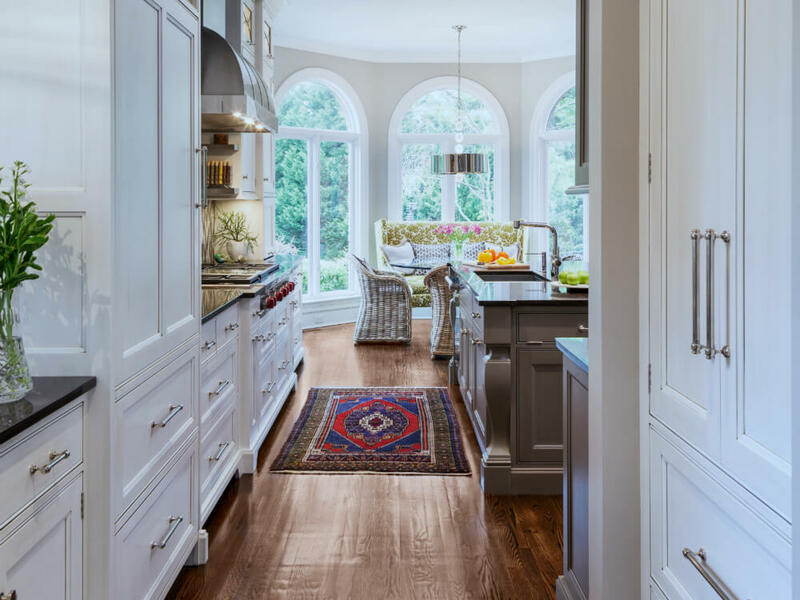 An existing hall was taken over to expand the square footage in this kitchen remodeling project, which allowed for a large center island. 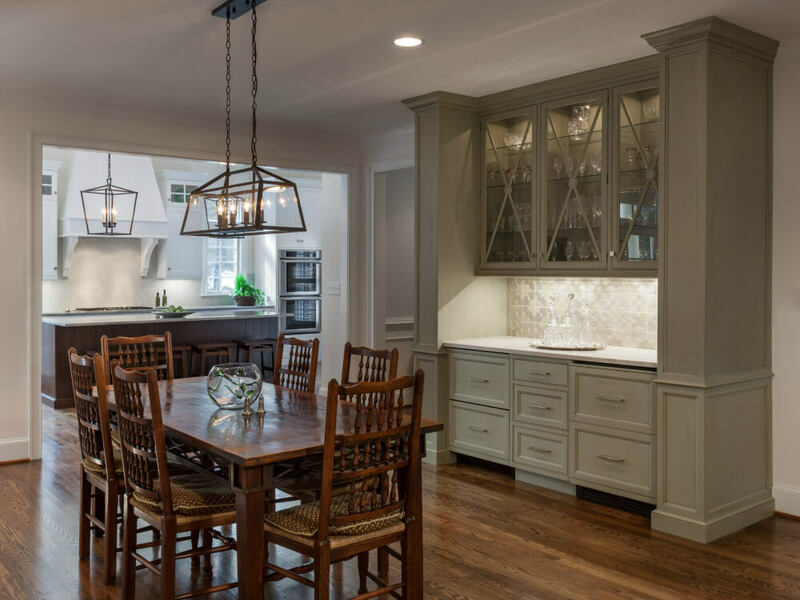 The island is the perfect gathering spot for family and friends. 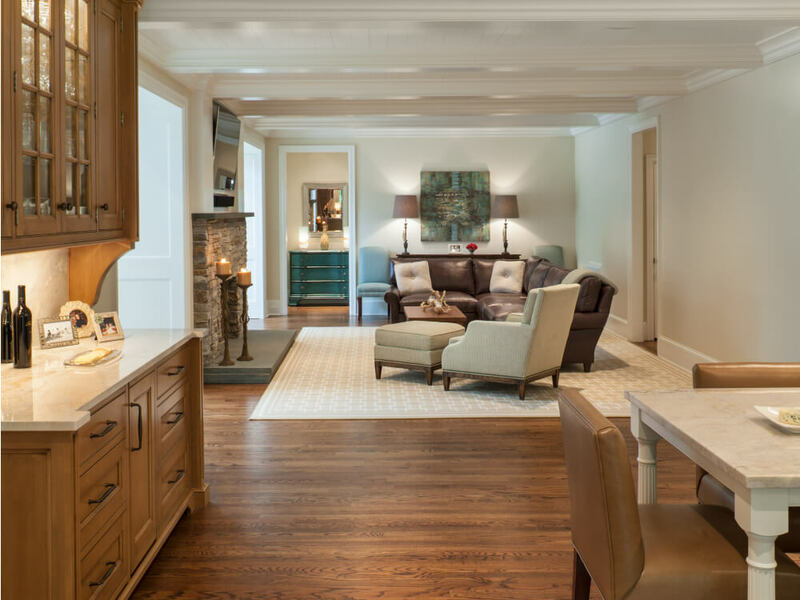 A combination of neutrals, stone, and wood keep this space casual and inviting. 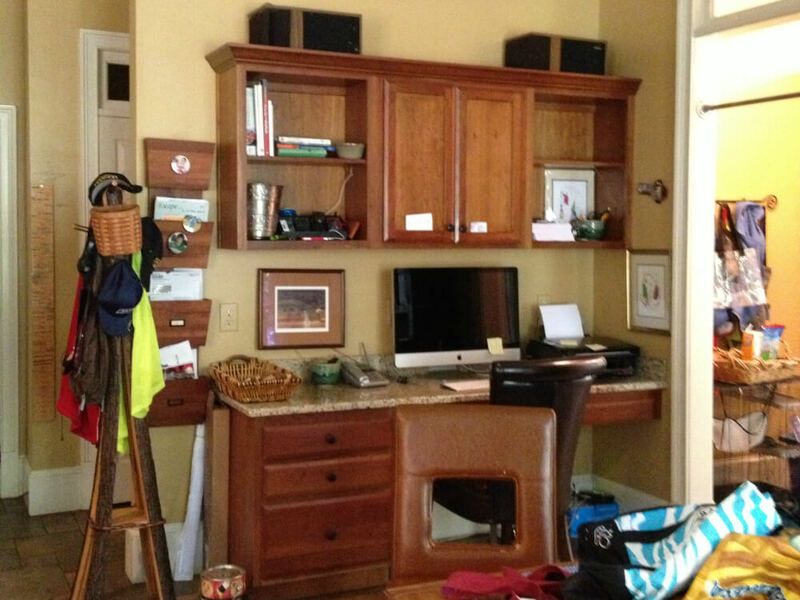 The goal was to keep a desk area in the kitchen that was functional and unique. 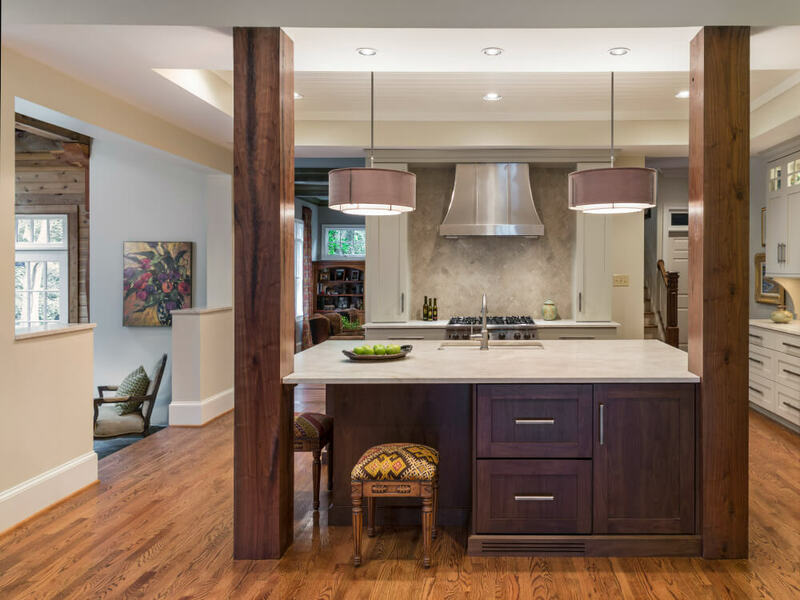 This design achieves both goals especially since the walnut planking on the wall was milled from a tree in their backyard. 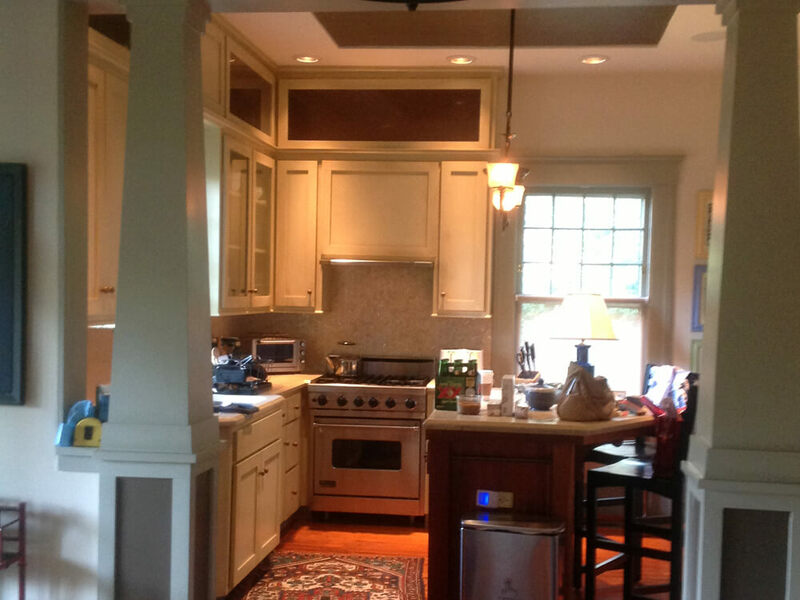 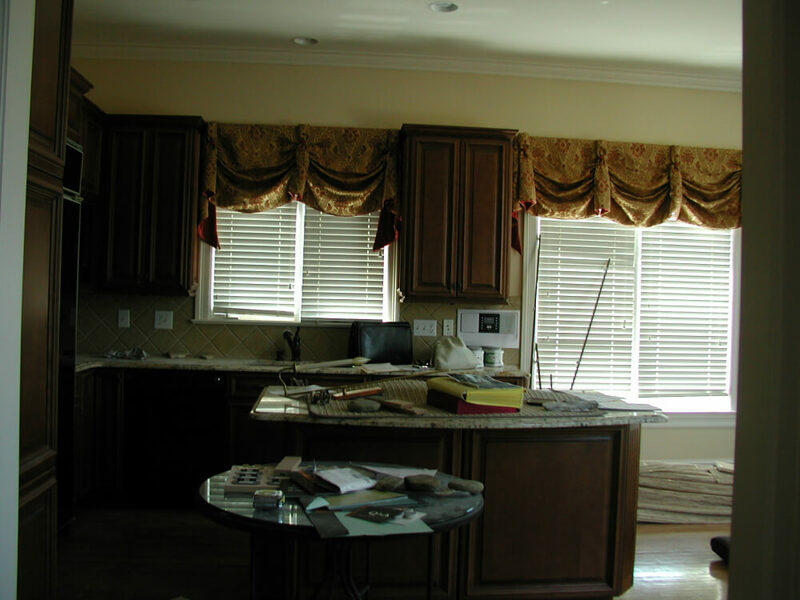 This kitchen and family room was in need of a complete lift and renovation. 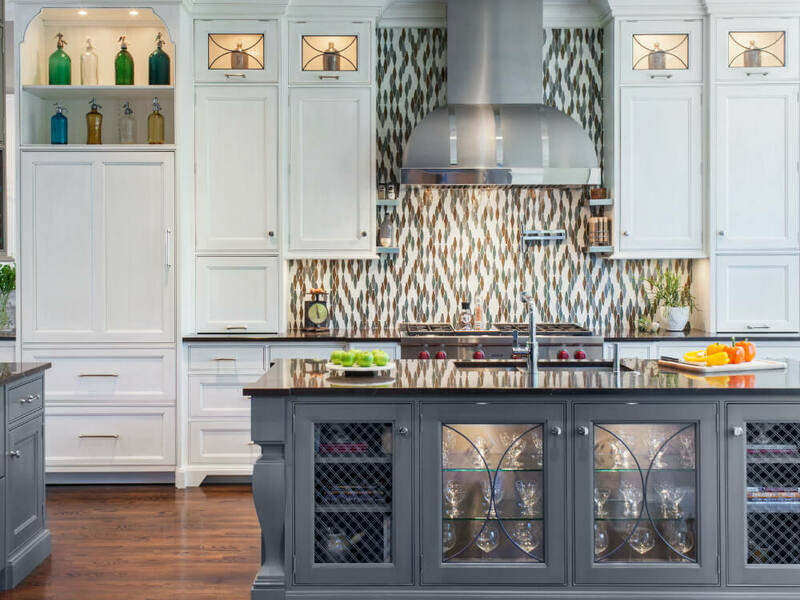 The colorful glass backsplash pairs well with white custom cabinets and a dark walnut island. 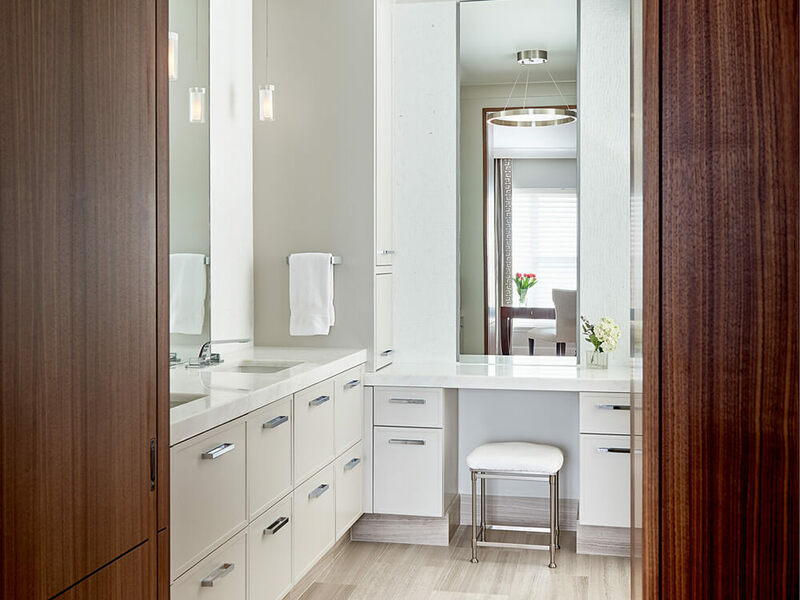 All the materials mix perfectly to achieve balance and proportion in this lofty room. 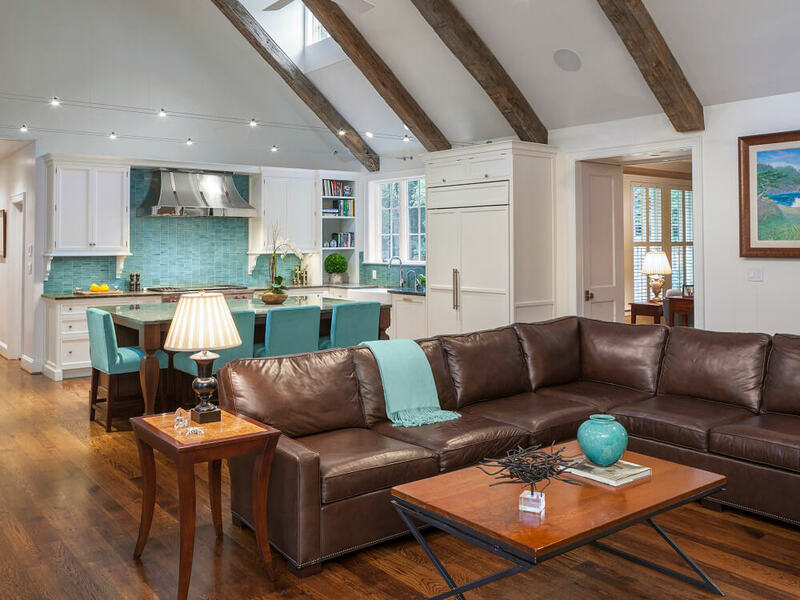 Don Duffy Architecture designed the vaulted ceiling with antique beams and dormers, which adds an exceptional architectural feature to the space. 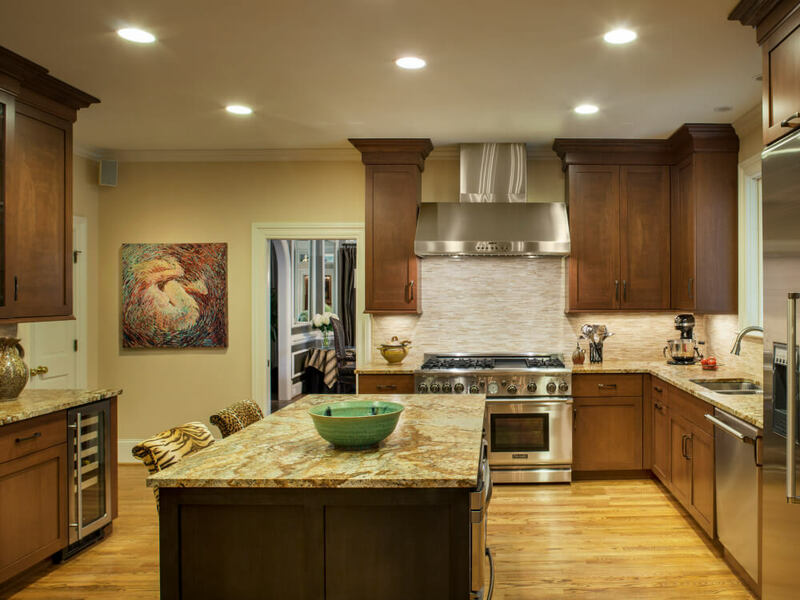 This generic kitchen was transformed into a one of a kind kitchen filled with beautiful materials and custom handcrafted cabinets. 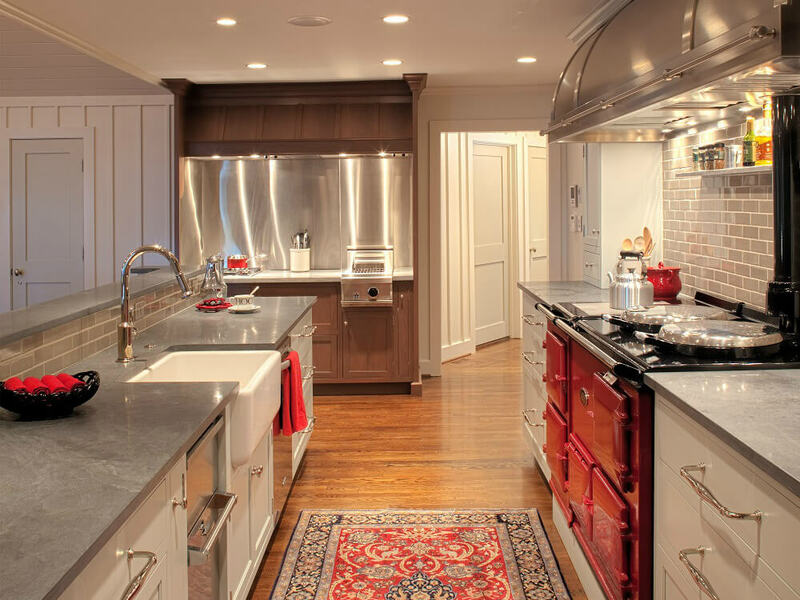 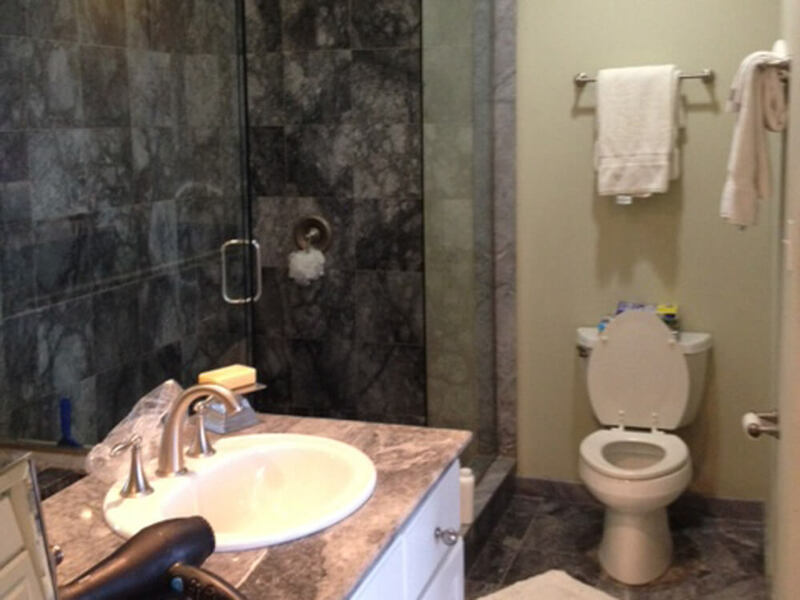 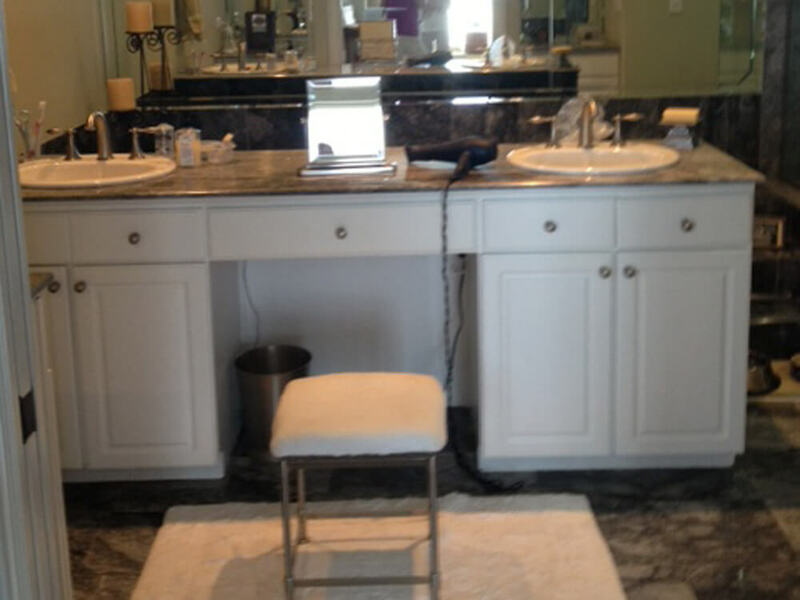 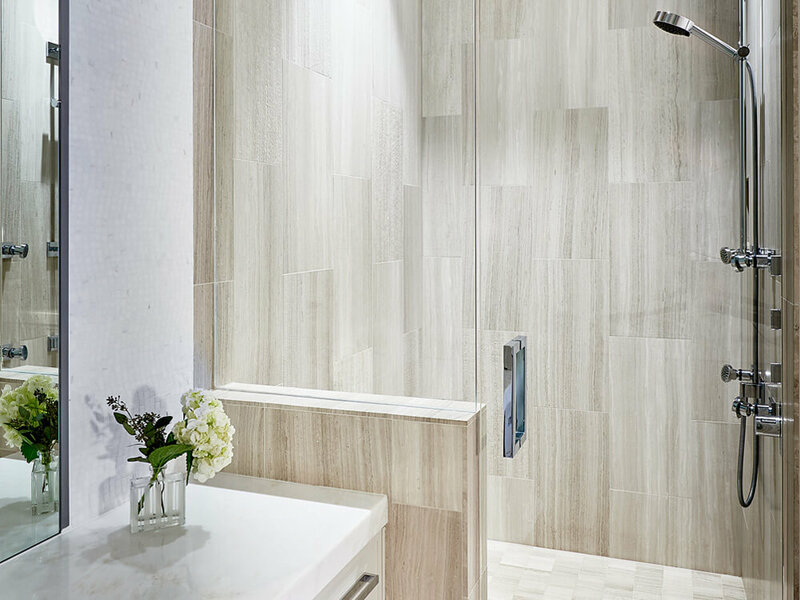 The entire space was completely redesigned to allow for better function and flow. 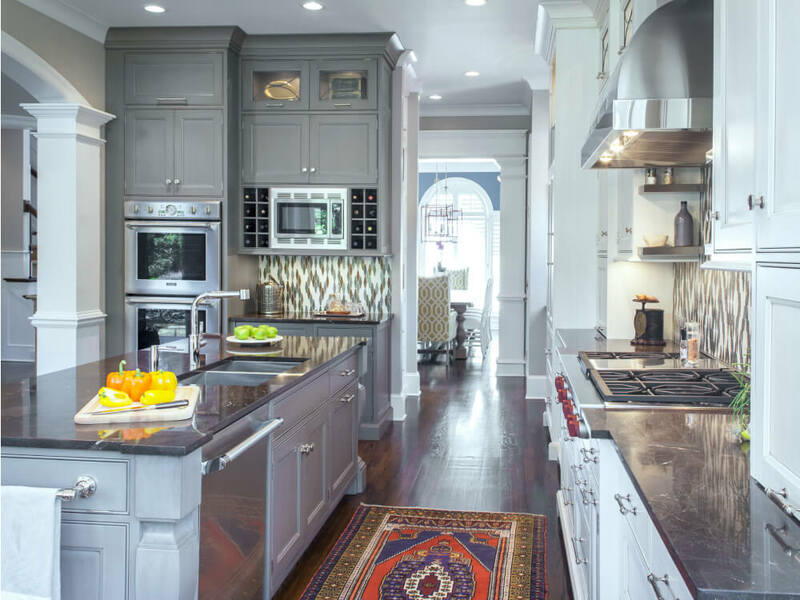 The custom gray paint and glaze pairs well with white painted cabinetry. 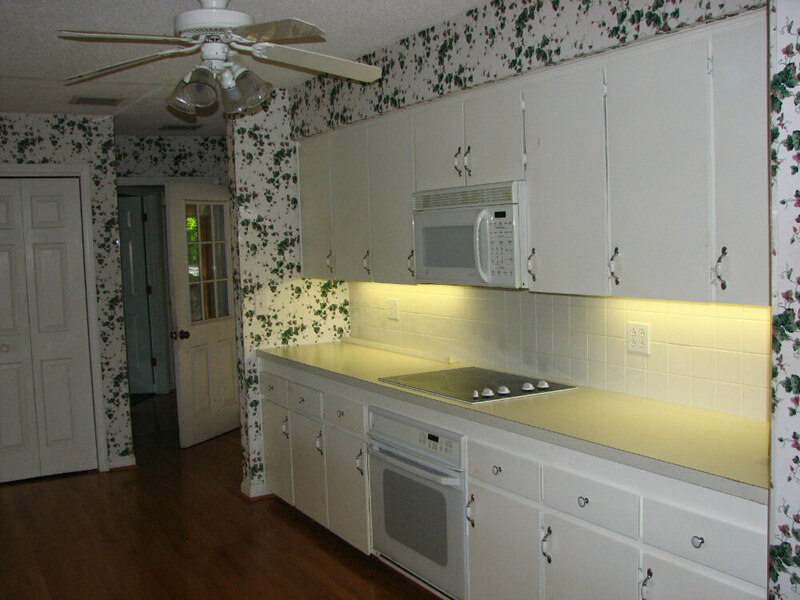 The kitchen was very dark originally which made the breakfast area less inviting for the family. 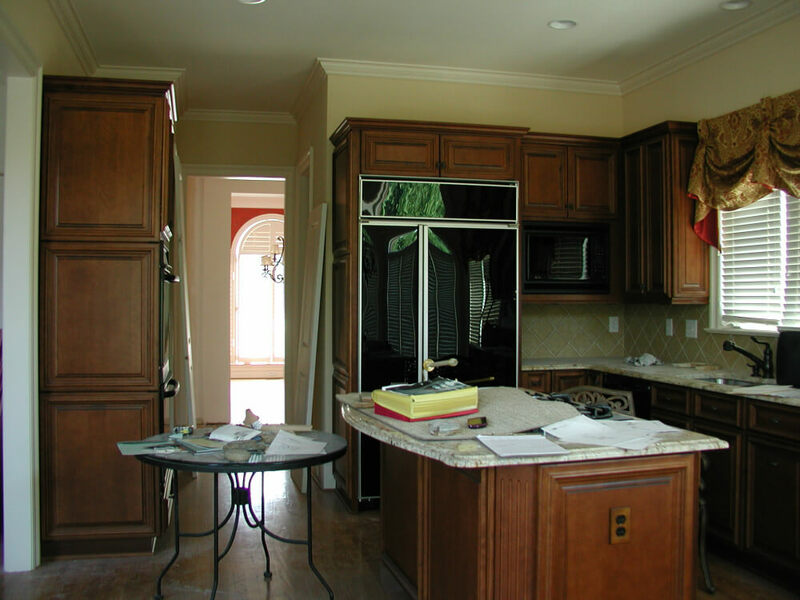 Now all the elements in the kitchen and breakfast area work well together to create a warm and welcoming space. 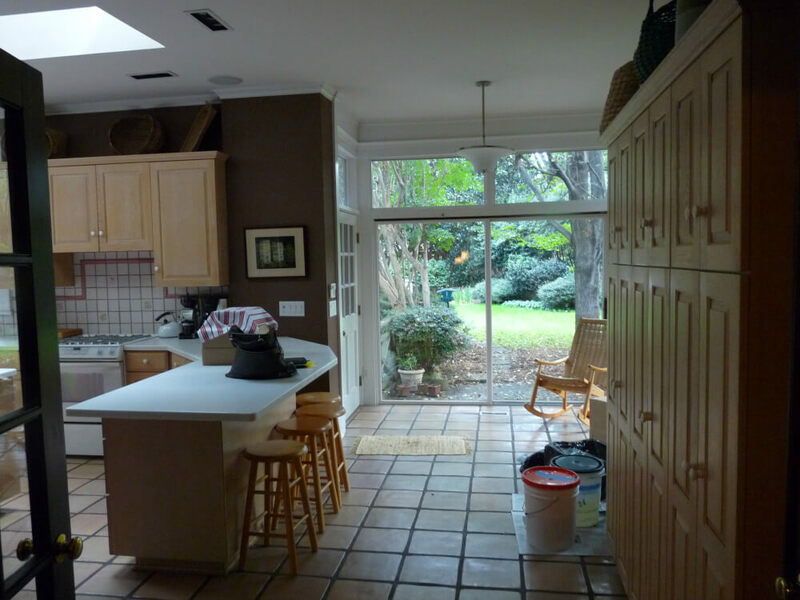 The original dining room at the front of the house was converted to a private office. 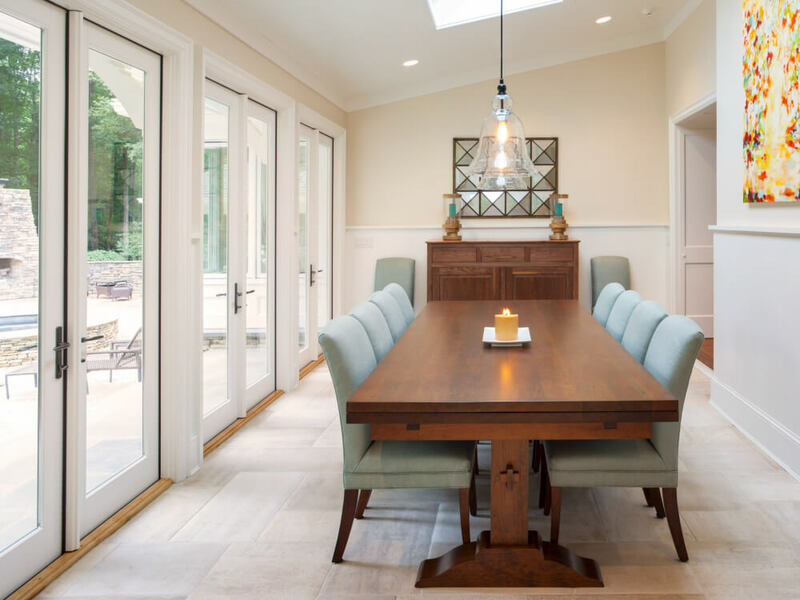 The new dining room was moved to this lovely space overlooking the pool. 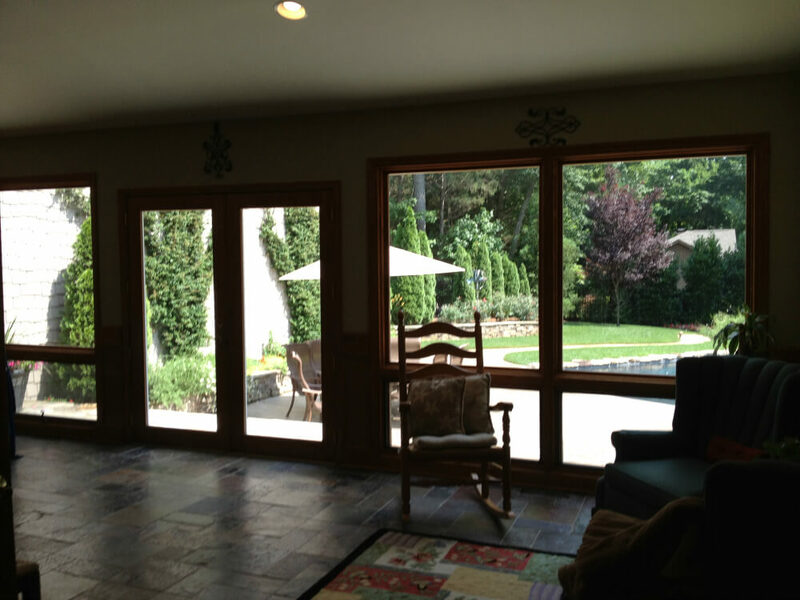 A new natural stone floor, French doors, and vertical planking wainscot connect the inside and outside beautifully. 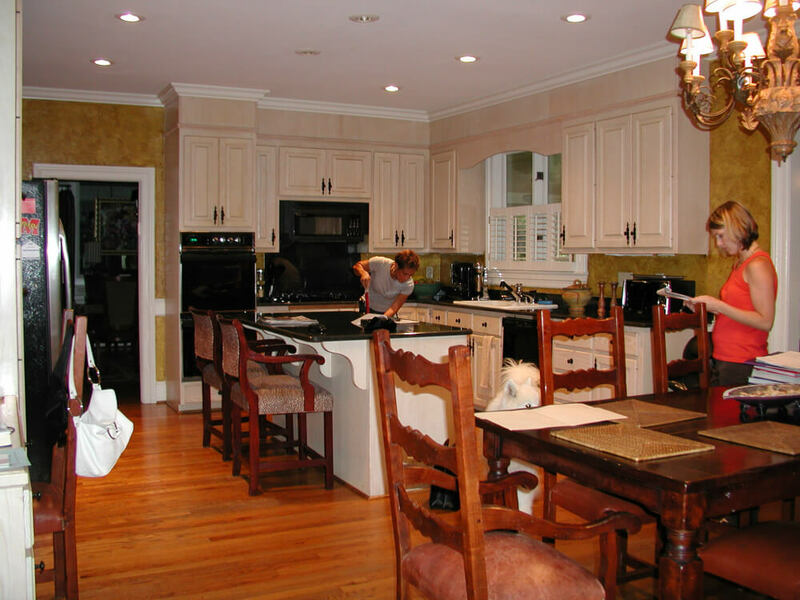 The family room was completely renovated to blend with the style of the new kitchen. 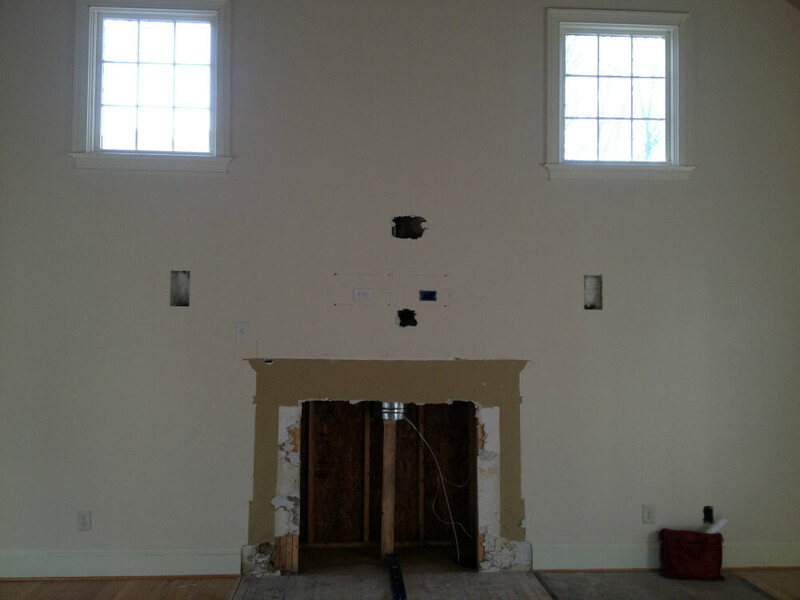 The floor was raised to the same level as the kitchen, a boxed beam and plan ceiling was added, as well as a new stone fireplace. 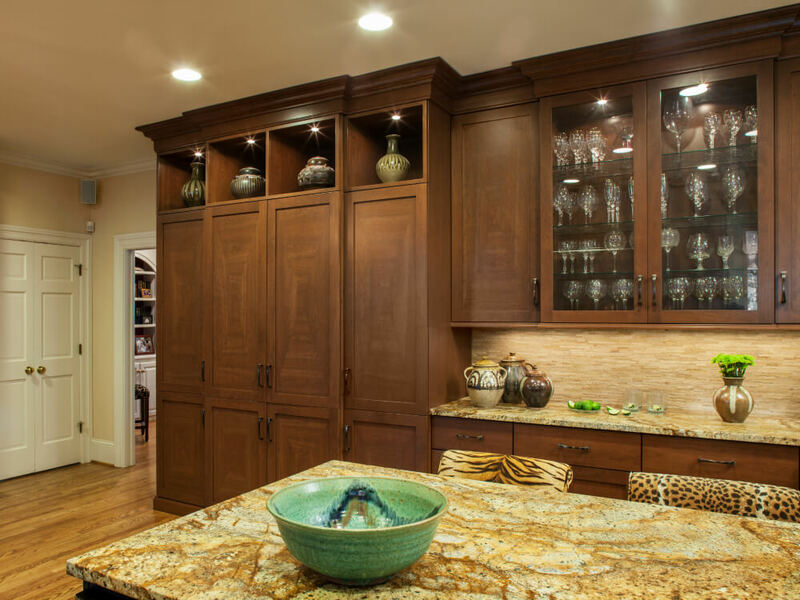 The custom bar is a perfect spot for a drink and appetizer station when entertaining.